On June 10, 2014, with the blessing of His Holiness Patriarch Kirill of Moscow and All Russia and His Holiness and Beatitude Catholicos-Patriarch Iliya II of All Georgia, an international academic conference was opened in Astrakhan to discuss the theme “Astrakhan and the Bagrations: the History of Two Burials” devoted to the sojourn in Russia of the Kings of Kartli, Vakhtang VI (1675-1737) and Teimuraz II (1700-1762), and the study of the history of their burial in the Cathedral of the Assumption at the Astrakhan Kremlin. The chairman of the Moscow Patriarchate Department for External Church Relations, Metropolitan Hilarion of Volokolamsk, attended. 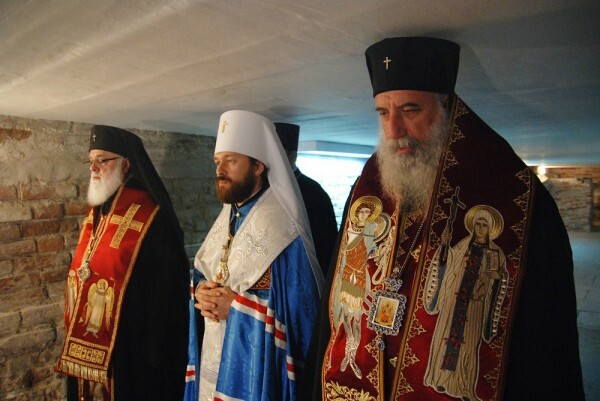 Before the opening of the conference, he and Metropolitan Gerasim of Zugdidi and Tsaish, head of the Patriarchate of Georgia’s department for foreign affairs, and Metropolitan Dimitry of Batumi and Lazeti said the Lity for the Dead at the tombs of the two kings in the crypt of the Cathedral of the Assumption. The conference is attended by bishops and clergy of the Russian and Georgian Orthodox Churches, as well as prominent scholars and experts from Russia and Georgia.